A Supreme Court case argued Monday could significantly weaken government unions across the country. If the justices rule in favor of the plaintiffs in Friedrichs v. California Teachers Association, every state in the country will essentially become a “right-to-work” state, where employees who choose not to belong to a public union won’t have to give it fees of any kind. California is one of the 25 states that collects fees from nonunion members. Known as an “agency shop” system, in these states individual employees decide whether to be a part of the union, but if they choose not to become a member, they still must pay the portion of dues that goes to collective bargaining because they are still covered by that contract. Data from the Union Membership and Coverage Database. Wisconsin is included with right-to-work states because all but its fire and police unions operate in this system. In a case spearheaded by the conservative Center for Individual Rights, which has also sought twice to overturn the Affordable Care Act at the Supreme Court, Rebecca Friedrichs and nine other California teachers sued the California Teachers Association. They claim giving the union any money violates their right to free speech. Unions fear that losing the case could reduce their rolls and their budgets and ultimately limit their influence, but Justice Antonin Scalia, the likely swing vote in the case, seemed unconvinced that outlawing agency fees would lead to their demise. The so-called “free rider problem” which is the argument that individual workers have little incentive to join a union and pay dues if they know they’ll be covered by the contract the union negotiates regardless, was only briefly discussed during arguments. Instead justices focused on issues like precedent and the difference between public and private employers. The court’s more liberal justices argued against striking down the agency shop system because it would overturn the 1977 decision of Abood v. Detroit Board of Education. Michael Carvin, lawyer for the plaintiffs, argued that a handful of more recent cases had set a new precedent. In 2014, for instance, the court ruled in a 5-4 decision, in which Scalia joined the majority, that private sector home health care workers in Illinois could not be forced to pay any dues for collective bargaining if they were not union members. He also ran with Scalia’s argument that it was the unions’ responsibility to argue the removal of agency fees would lead to their extinction. “They can’t make such an allegation,” he said, noting that 25 states don’t collect agency fees but still have unions. But the unions in these states are generally smaller. Roughly 20 percent of public employees in right-to-work states belong to a union, compared to nearly 50 percent in agency shop states, according to the Union Membership and Coverage Database, which uses federal data to estimate annual membership in each state in both the public and private sectors. A ruling in this case would only impact public unions. The 12 states with the highest levels of public sector unionism are all agency shop states. Nearly three-quarters of public employees are union members in New York. In California, which ranks sixth in union membership, 55 percent are in a union. Angela Cornell, director of the Labor Law Clinic at Cornell University’s Law School, said in states like Indiana and Michigan, which only recently became right-to-work, the full ramifications of the shift are yet to be felt. In Michigan, during the first year of the right-to-work system, overall union membership dipped from 16.2 percent to 14.5 percent. Public sector union membership dropped from 54.8 percent to 50.5 percent — still much higher than states that have been right-to-work for decades. In those states, “it’s very, very hard for [unions] to make it because of the free rider problem,” Cornell said, adding that wages for union employees are lower, on average, in right-to-work states. But the plaintiffs say concerns about free riders shouldn’t trump their right to free speech. They take issue with some of the things that the California Teachers Association charged them for as part of their collective bargaining, including most of the cost of a Gay, Lesbian, Bisexual and Transgender (GLBT) conference. The plaintiffs also argue more broadly that individual teachers may disagree with the terms of the contract the union negotiates. Unions across the country have opposed connecting teacher pay to student test scores, for example, even though some members are in favor of doing so. “Agency fees require that employees and teachers who disagree with those positions must nevertheless subsidize the union on those very points,” he said. 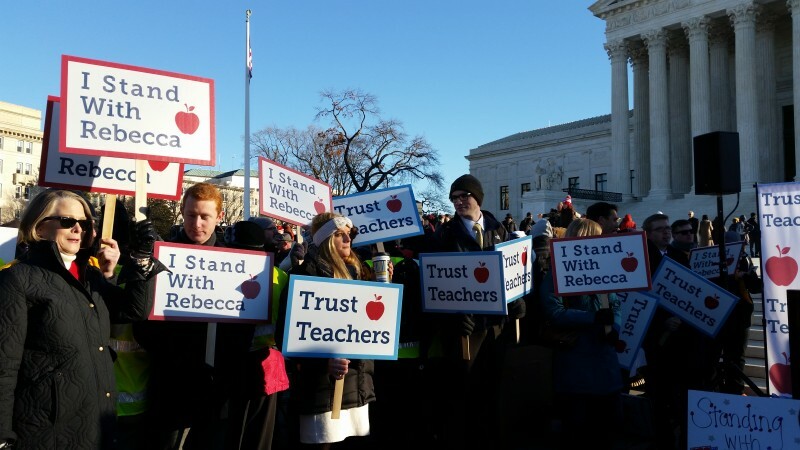 Other justices pointed out, however, that teachers are free to lobby and speak their mind as individuals outside of the union. Breyer also called into question how much freedom of speech applied in this specific case.